2013 Score Football, which marks the brand's 25th anniversary, sticks to its set-building roots. Affordable and packed with content, Panini is upping the ante with jumbo hobby packs. Each pack has 50 cards. These boxes have three total autographs and memorabilia cards, at least two of which are guaranteed to be signatures. 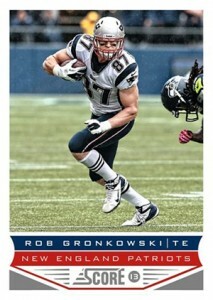 The 2013 Score Football base set is 440 cards large. This breaks down to 220 veterans, 110 rookies and four subsets. Airmail, Franchise and Future Franchise are each 32 cards. 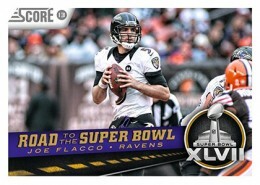 Road to the Super Bowl, which honors the Ravens' Super Bowl victory, is 14 cards. Rookie cards are a throwback to 1989 Score Football when Barry Sanders, Troy Aikman and others debuted. Four familiar parallel sets deliver a chase side to the base set: Scorecard, Gold Zone, Red Zone and Artists Proof. There are also one-of-one Printing Plates. Rookies figure prominently into the 2013 Score Football autograph lineup. Rookie Signatures and Hot Rookie Signatures both highlight first-year players. Inscriptions include veteran signatures. Memorabilia sets include Franchise Fabrics and Future Franchise Fabrics. Eddie Lacy, 2013 Score (Packers), AUTOGRAPH, !!! ROOKIE!!! Good: Stellar photography, revised configuration, attainable base set, autographs galore, reasonable price. Bad: Some subsets could standout more design-wise, possibly as inserts. 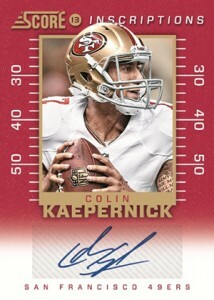 The Bottom Line: 2013 Score Football sets a high standard for the new football card season, especially for set collectors. The base set looks fantastic and offers one of the more comprehensive checklists of the year. The new hobby configuration may cost more, but it's still very much in line with similar products. This isn't like the Score you might remember (although the rookie cards look an awful lot like them). Within seconds of ripping into my first pack, it was easy to tell that stellar photography was one of the set's cornerstones. And with 50 cards per pack to go through, it makes for a fun pack break. And that's even before looking at the names. And when you have a quality-looking card, it takes away a lot of the pressure of landing a "big" card. Instead, these can be enjoyed, studied and sorted. It would have been nice for the subsets to come with a more distinct look. Most have the same design save for a different banner in the nameplate. The Road to the Super Bowl cards have a more distinct change, helping them standout from the rest of the set. More of this with the other subsets would have helped. Outside of parallels, there aren't many inserts. Hot Rookies have a wild design. They're bold, maybe a little too bold. Or a lot, depending on your preferences. With a big base set, this is a checklist that draws in both set builders and team collectors. 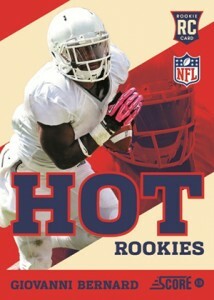 It covers all the major players as well as a large crop of 2013 rookies. I would have preferred the subsets be removed from the base checklist and made inserts instead. This would have added another dimension to the set without compromising the overall player selection. And while some base sets go overkill on inserts, 2013 Score Football doesn't reach the saturation point. It has enough room to cover these subsets as inserts without feeling like bloat. 2013 Score Football does cost more than past Score sets, but it's still much cheaper than most sets. The likelihood of getting a single card worth a ton of money is slim, but with three autographs per box, short printed rookies and the many other components, a savvy collector probably won't lose much in a worst-case scenario. Most parallels are numbered, which certainly helps. And with such a big checklist, the numbering for many sets is quite low. Three autographs per jumbo box is great, even if most are unproven rookies in a year of uncertainty. Some veteran autographs are also up for grabs. There's also something to be said about sifting through and enjoying the cards themselves without getting wrapped up in what they're worth. With such a fun product, 2013 Score Football makes this easy. For collectors not concerned about big hits or top rookie cards, it's going to be tough to beat 2013 Score Football. It successfully mixing quality and quantity. The new jumbo pack configuration makes putting together a base set that much easier. And even when you don't get a big card, 50 cards for about $10 is reasonable, especially when they look so good. 2013 Score Football is a reminder that rookie crops and high-dollar cards aren't the only ingredients to a great set of cards. Sometimes you just need something that's attractive, comprehensive, reasonably priced and distinct. You know, compelling. “As a rookie in Indianapolis, he caught his passes from #1 pick Andrew Luck.” The first sentence talks about catching passes from #2 pick RG3 while at Baylor, so context indicates that this wasn’t just a small editing error. John L � You’d have to contact Panini, though very few errors are corrected anymore. Looks like Score is back to more premium product, slightly. 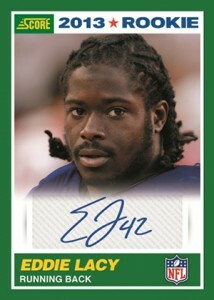 Bought a jumbo pack @ local card shop & pulled an autographed Matt Elam RC #’ed to 25, pretty impressive for first pack. 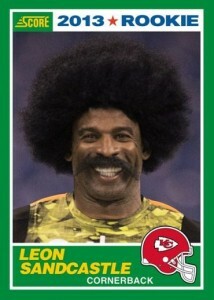 What are the odds of finding the Leon Sandcastle card? I gotta get me one!!! These cards have a peculiar smell to them too, kinda weird, but I like the product. Definitely one of Scores best products in several years. I just opened my first pack (52 card Jumbo pack) and the first Rookie card I pulled was an autographed Johnathan Cyprien card. He was picked #30 in the draft by the Cardinals. This years Score has had a huge facelift compared to Score products in the past. The base cards have a really nice design and great photos of the players. My favorite has to be the David Wilson #141 in his Matrix style flip. I have not been able to pull a “Leon Sandcastle” card yet. I’ll look into obtaining a “Sandcastle” card via the secondary market. For a inexpensive and affordable product, Score has met and exceeded my expectations. I really like the makeover of this product; I like how there are more inserts, yet Score kept its affordability. Also, I’m wondering if Score has included any SP’s in this year’s set. There’s only one thing that annoys me, which is that if a player has a long stat list, like the Steve Smith that I have, the whole design on the back of the card changes. The retro rookie design is what drew me to the product. I think score has gotten back to a quality product. If you read the press release regarding Leon sandcastle cards, he is only available in retail packs. I have a red Leon Sandcastle, pulled from a pack I got at Target. I was skeptical about this product because of all the pictures that I saw of this set, because they looked really underwhelming. On a whim, I picked up a couple of packs from the local Wal-Mart (the nearest actual card shop is 1.5 hours away), and for the price the base set looks really nice! Some of the inserts / subsets are a little underwhelming, looking too much like cards from the base set. The “Franchise”, “Future Franchise” and “Airmail” subsets are indistinguishable from the overall base set, and the “Hot Rookies” insert set could really use a little flair. Where this set seems to shine is the autos and memorabilia cards. The memorabilia cards look really nice and the card stock has a good feel to it, and the autos come on a variety of the inserts and subsets (including the “love-it or hate-it” 1989 design rookies). Overall this set is a steal with a sub $2 per pack price point (retail packs), good looking base set, and a jumbo hobby box that boasts 50 rookies per box and at least 3 autos + 1 more memorabilia or auto per box at a price often under $90. I bought a hobby box for $99 from Walmart today. 1st pack had an RG3 inscriptions auto, 2nd pack had Matt Barkley auto red border numbered 13/49. Last pack had Tarvaris Jackson black printing plate 1/1 and Adrian Peterson Franchise Fabric Tags numbered 1/10. Not bad pulls . I bought a value pack at target. Wasnt expecting much, but pulled four rookies, and some great cards. 5 bucks got me 104 cards! Things I like: Great looking design on the base cards. Retro design on the rookie cards. 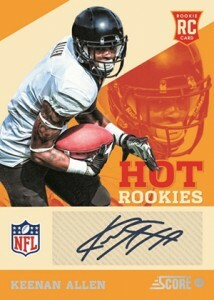 Groovy design on the Hot Rookies. Fantastic photography all around. Much fewer parallels in packs than in years past. Things I don’t like: So many photos turned sideways. These look awful when paged up, and really what was the purpose? The picture box is almost a perfect square. It’s not like we’re getting that much more photo by turning them on their sides. Things I would suggest for improvements: Stop putting the teams in alphabetical order (Arizona 1st, Atl 2nd, etc). Put them in order of SB winner, SB loser, conference championship losers, playoff teams, and then the rest of league sorted by record. Once I get a complete set I plan on doing this on my own anyway. I’m a little confused this year with the pricing. Loose packs and blasters are double what they were last year (for the same amount of cards) yet rack packs are the same price/amount of cards. Rack packs certainly seem to be the way to go if you’re trying to build a set. If any set builders are looking for a trade partner I’d be interested. 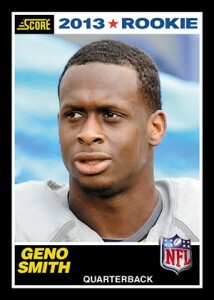 According to Marquess Wilson’s rookie card he’s 114 years old…he’s getting around pretty good I’d say! makes it worth the purchase alone!! I got 12 ben rothlesburger from an old set. I pulled an AP inscriptions auto and I want to know the print run. Does anybody know? I’ve only seen one other.